Update: Xioami has officially launched the Redmi Note phablet in India, and this wasn’t the only announcement today by the company. The Redmi Note goes on sale for the price of Rs. 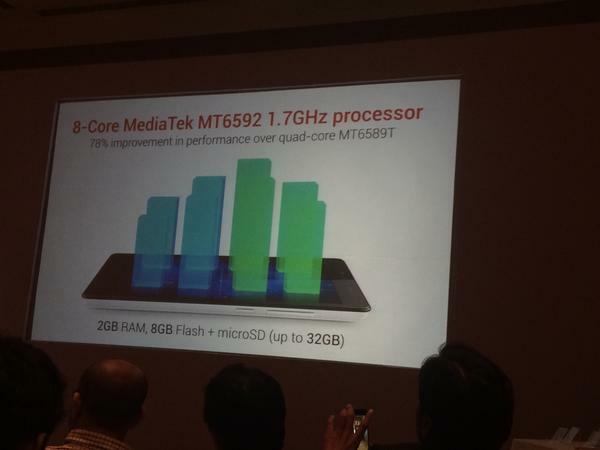 8999, and the unit going to be sold in India is an octa-core 1.7 GHz (MT6592) variant with 2GB RAM. The internal storage is 8GB and there is a MicroSD card slot for storage expansion to 32GB. Update (23rd Dec 2014): Xiaomi is going to sell the Redmi Note 4G through the same flash sale on Flipkart, on December 30th 2014. You can register for the flash sale on Flipkart. The device has a 13-megapixel f/2.2 camera with 28mm wide angle lens and HDR, and there is a 5-megapixel front-facing camera as well. The 3100 mAh Li-ion battery in the Redmi Note is going to have support for fast charging. The 2A charger is going to be included in the box. A screen protector and a SIM card sleeve will be given for free with every unit. Registrations for the first sale of Redmi Note starts from 25th November, and the first sale is on December 2nd. Xiaomi is also going to launch a special Redmi Note 4G only for India. It will be powered by Qualcomm Snapdragon 400 processor. The Redmi Note 4G will have a support for Indian 4G bands, (i.e. FDD LTE 1800MHz and FDD LTE 2300MHz 4G bands). The Redmi Note 4G will be sold on Flipkart, and in select Airtel Flagship stores across 6 cities in India. The Redmi Note 4G is to be priced Rs. 9999. It will be available in the second half of December 2014. While the Redmi Note 3G will have Dual SIM with Dual standby, and it is going to run Android Jelly Bean OS, the Redmi Note 4G will have a Single SIM and it is coming with Android KitKat OS. Xiaomi has promised MIUI v6 update to all the devices by 1st quarter of 2015. It is just a couple days from now when Xiaomi will officially launch the Xiaomi Redmi Note smartphone in India. The event is going to be held on 24th Nov, and Xiaomi is bringing no changes in its sale strategy, as the device would be officially listed for sale on the online retailer Flipkart. We have received the official invite for the launch event, and because the event is on 24th, the sales are expected to start from 25th Nov, i.e. Tuesday, the day when Xiaomi puts up the Redmi 1s on flash sale every week. The pricing that was announced when Xiaomi launched the Mi3 a couple of months back, was Rs. 9999 for the Redmi Note. Let’s stick to the same pricing right now, because there is no information about a price change, if any. The Redmi Note falls into the phablet category, with the 5.5-inch HD display competing against several market players right now, but the pricing is a factor many might consider, and that was the reason why Xiaomi’s two devices Mi3 and Redmi 1s got great sales in India. The Note is powered by Mediatek MT6592 Octa-core processor and Mali-450MP4 GPU along with 2GB RAM. It is the MIUI ROM over Android (version not confirmed), and 8GB internal storage is given along with a MicroSD card slot for storage expansion. The device has a 13-megapixel rear camera with LED flash and 1080p video recording capability and there is a 5-megapixel front-facing camera. Don’t be surprised though, if the company launches the smartphone / phablet for Rs. 8999, as that is what a few leaks claim, and that is how the pricing was set for the two previous smartphones from Xiaomi. We’ve be covering the event live on 24th Nov.